While the salad course was pretty and edible, if not spectacular, the dinner course was absolutely lovely. The ratatouille is a bit time consuming with the peeling and seeding of the tomatoes and all of that slicing and dicing, but the flavor combination with the polenta was fantastic! I used tuna steaks, since the stores I went to were all out of swordfish. I’ll definitely try this stack again. It’s not as sweet as the Shrimp Cake Stacks which are still a huge favorite for me. However, it’s really a healthy and flavorful stack. To make the swordfish, brush the swordfish steaks with olive oil and place over hot coals or under a high broiler flame. Cook a total of 8 minutes-4 minutes on each side. Coarsely chop the cooked swordfish. To make the polenta, cook the polenta according to the package directions, adding 2 Tablespoons extra virgin olive oil and 1 teaspoon salt to the water. Add the butter, Parmesan, rosemary and salt at the end. Mix well. Pour polenta into a lightly greased 12 x 17” sheet pan and smooth to ½ inch deep. Let rest for 20 minutes to firm up. When the polenta is firm, cut 16 3” rounds. (Use your stack cylinder as a cutting tool.) Set aside. To make the ratatouille, heat the oil in a large frying pan. Add the eggplant and sauté until browned. Add the onions and garlic and sauté for about 3 minutes. Add the zucchini, peppers, and tomatoes and cook, stirring until the vegetables are just cooked through but not mushy, about 5 minutes. Add the basil, artichoke hearts, salt, and pepper and heat through. Stir in the lemon juice and remove from the heat. Spray 6 stack cylinders with vegetable spray and place them on a greased sheet pan. 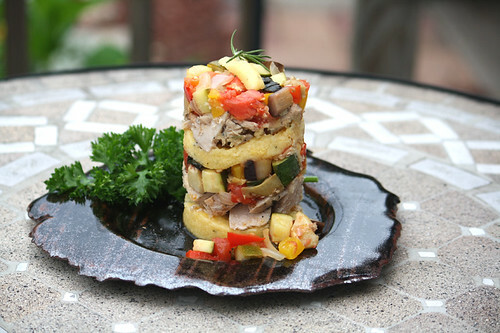 Layer the stacks in the following order: 1 round of polenta, 3 Tablespoons swordfish, 3 Tablespoons ratatouille. Repeat the layers, ending with the ratatouille. Bake stacks for 10 minutes, or until heated through. To serve, slide a spatula under each stack cylinder and transfer to a plate. Garnish with additional ratatouille, parsley, and Parmesan. Cut decorative shapes from the remaining polenta and place on stack tops. It is a piece of delicious art! Holy moley! Cooking AND architectural skills. I can barely put two Legos together. The addition of swordfish to ratatouille sounds delicious to boot.